Floating down the Usumacinta River in southeastern Mexico and northwestern Guatemala, various Maya sites materialize out of the dense jungle, some rising above the canopy and others subsumed by a tangle of green growth. One such site is Yaxchilán (pronounced Yash-chee-LAN) located in Chiapas, Mexico (close to the border of Guatemala) between the famous Maya cities of Copán and Palenque. The site is host to an impressive number of structures and monuments—over 100—and is especially famous for its high-quality relief carvings. Yaxchilán’s ruling dynasty rose in the 4th century C.E., but its heyday followed several hundred years later (during what art historians call the Classic period), with Lord Shield Jaguar II who ruled for 60 years beginning in 681. He commissioned some of the most famous sculptural works at the site. His son and heir, Bird Jaguar IV, continued this tradition. Some of the most impressive Maya buildings and sculptures were created during this late-Classic period before the city-state collapsed in the 9th century. 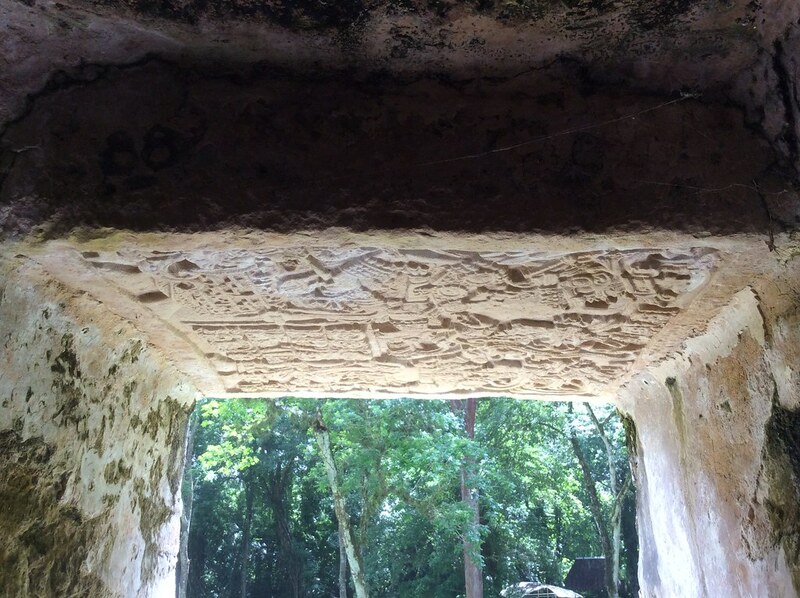 Shield Jaguar II’s commissions at Yaxchilán’s central complex of buildings (called the Central Acropolis) include carved lintels (the beam at the top of a doorway), stairs faced with hieroglyphic writing, and stele (upright wood or stone slab monuments). Some of the most famous lintels are those on Structure 23—a yotoot (palace building) showing Shield Jaguar II’s wife, Lady K’abal Xook. Anyone entering Structure 23 would pass underneath the limestone lintels when entering the doorways; the lintels are thus situated in a liminal space between exterior and interior. Before the construction of Structure 23, there was a hiatus in building at Yaxchilán for about 150 years. This building’s construction is therefore important, and so too are the individuals it showcases. But why focus on Lady Xook rather than Shield Jaguar II exclusively? It might be that the ruler wanted to promote his lineage and power through his principal wife (who had more prestige than his other wives). Structure 23 is therefore important not only for advertising Shield Jaguar II’s power, but also for highlighting the important role of royal women in Maya culture. 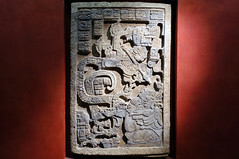 Other relief sculptures, such as Lintel 45 on Structure 44, show Shield Jaguar II with war captives to commemorate his victory in battles against rival city-states. The three lintels on Structure 23—known as lintels 24, 25, and 26—depict different ritual moments in the life of Lady Xook. While they appear to have been carved years apart from one another, they seem to show a narrative. Note: the monuments and objects uncovered at Yaxchilán are numbered in the order in which they were found—so Lintel 1 is not the oldest, but rather the first to be excavated by archaeologists. On Lintel 24, Lady Xook pulls a thorned cord through her tongue so that she can bleed onto paper that fills a basket on the ground before her. She is engaged in bloodletting—the ritual shedding of blood. Her husband, Shield Jaguar II, holds a lit torch above her. The glyphs (writing) on the top note Lady Xook’s titles, and mention that the events depicted occurred on 28 October 709 C.E. 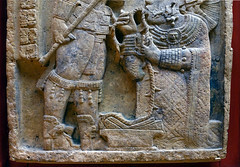 Lintel 25 (left)—from the central doorway—also focuses on a bloodletting ritual carried out by Lady Xook. Bloodletting was a common ritual among elites and it is one of the most frequent subjects in Maya art. A ruler or other elites (including women), would let blood to honor and feed the gods, at the dedication ceremony of a building, when children were born, or other occasions. Rulers needed to shed blood in order to maintain order in the cosmos. The ruler was believed to be a descendent of the gods, and the act of bloodletting was of critical importance in maintaining their power and order in the community. Bloodletting was also an act related to rebirth and rejuvenation. On Lintel 25 (left), the effects of bloodletting are on display. The loss of blood and the burning of incense produced hallucinations, which were desired in certain ritual contexts to access other realms. In this lintel, Lady Xook (in the lower right) kneels before a vision serpent, from whose mouth emerges a figure. Look closely at the detail below. Lady Xook holds a bowl in her left hand while she looks up towards the rising serpent. In addition to her patterned huipil (square-cut blouse), Lady Xook is festooned with a headdress, elaborate bracelets, earrings, and a necklace—likely made of jade. In the bowl are pieces of paper stained with her blood. She has likely burned the paper to allow the blood to ascend to the gods, and to bring about the vision serpent. In the image below, you can see that the figure emerging from the vision serpent’s mouth is armed with a shield, spear and a war helmet. He, too, wears an elaborate headdress, a breastplate and ear spools. The identity of this figure is debated; some scholars claim it is an ancestral figure while other believe it is Shield Jaguar II or perhaps even Lady Xook. A glyphic inscription (oddly, written backwards) in the upper left corner of Lintel 25 notes the date of Shield Jaguar II’s ascension to the throne in October 681. The image and the inscription both reinforce the reign of the ruler and his dynastic ties, in this case via his wife. The lintels exemplify the skilled carving of Maya artists at Yaxchilán—and the Maya more generally. The scenes are carved in high relief with carefully incised details decorating the raised surfaces. A beautiful diamond pattern decorates Lady Xook’s huipil, for instance, in Lintel 24 (left). The contour and incised lines of the lintels possess a calligraphic quality, as if they were drawn or painted rather than carved. Such careful attention to detail as well as the formal qualities of the line compare to other Maya sculptures, as well as vase painting and murals. 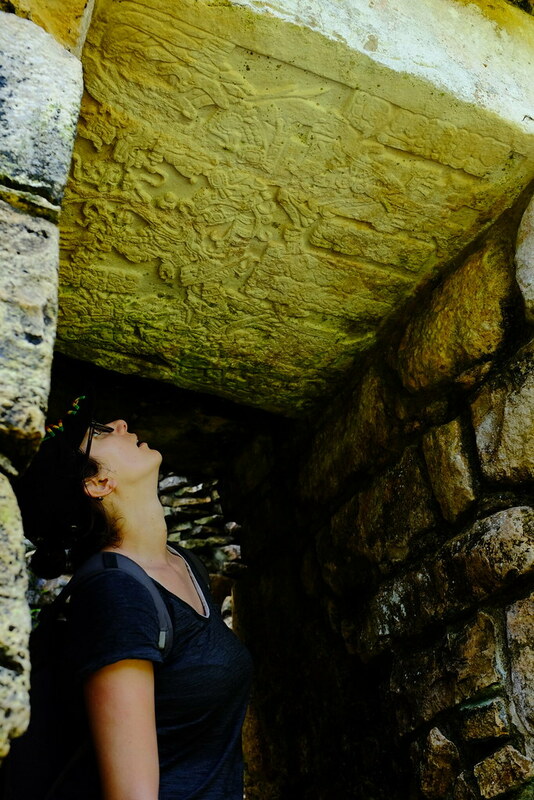 The Yaxchilán lintels were originally painted, although only traces remain, including red on Lady Xook’s clothing and the brilliant Maya blue color on the background of Lintel 24. Also located within the Central Acropolis near Structure 23, Structure 33 (dedicated around 756 C.E.) is a wonderful example of Maya Classic architecture, particularly of the Usumacinta and Peten region or “style” as some would call it (image below). It was most likely built by Bird Jaguar IV, who like his father Shield Jaguar II engaged in a series of building projects and commissioned various monuments as part of his campaign to legitimate his rule. Bird Jaguar ascended the throne ten years after his father died, suggesting that there was perhaps a conflict about who was to become Yaxchilán’s ruler. Structure 33 rests on the side of the main plaza, making it a focal point for the area. The building itself is narrow, only one vault deep, so it was not intended to hold many people. Three entryways punctuate the exterior—which is embellished with stucco ornamentation. An elaborate roof-comb (a masonary “wall” that rises upwards above a building to give the impression that it is taller than it actually is), arguably the most famous component of the temple, incorporates a decorative frieze, niches, and sculptural elements, including a sculpted human being in the central niche. It is possible that this is Bird Jaguar IV. Intricate latticework covers the symmetrical roof-comb and the building’s overall style is reminiscent of buildings found at other important Classic Maya city-states like Palenque. Hieroglyphic Stairway #2 leads up to the building. 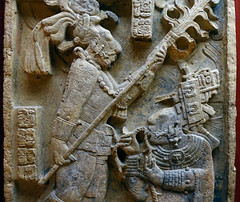 The top step of Structure 33 displays rulers, including Bird Jaguar IV and his father and grandfather playing the ballgame in a series of thirteen carved limestone blocks (today protected by an overhang and glass, see the image above). They play against Yaxchilán enemies—such as Lord Jeweled Skull who Bird Jaguar defeats. Bird Jaguar IV also had Structure 40 built as part of his political campaign to secure his rulership. Structure 40 (above) sits in the South Acropolis, flanked by two other structures. It displays the typical Yaxchilán architectural style—a rectangular vaulted building with a stuccoed roof comb. 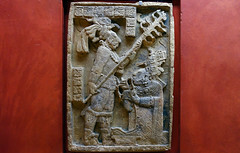 Like many other Yaxchilán buildings it had stele associated with it, such as Stela 11 that showed Bird Jaguar IV towering over war captives accompanied by his parents. 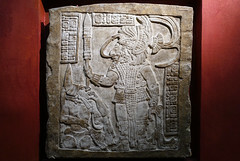 The stela, like the buildings and other commissioned works, were intended to advertise Bird Jaguar IV’s dynastic lineage and thus his right to rule. Michael D. Coe, The Maya, 9 ed. (London: Thames & Hudson, 2015). Simon Martin and Nikolai Grube, Chronicle of the Maya Kings and Queens: Deciphering the Dynasties of the Ancient Maya (London: Thames & Hudson, 2000). Mary Ellen Miller and Megan O’Neil, Maya Art and Architecture, 2 ed. (London: Thames & Hudson, 2014). Linda Schele and Mary Ellen Miller, The Blood of Kings (London: Thames & Hudson, 1986). Carolyn E. Tate, Yaxchilán: The Design of a Maya Ceremonial City (Austin: University of Texas Press, 1992). Cite this page as: Dr. Lauren Kilroy-Ewbank, "Yaxchilán—Lintels 24 and 25 from Structure 23 and structures 33 and 40," in Smarthistory, April 9, 2016, accessed April 19, 2019, https://smarthistory.org/yaxchilan-lintels/.